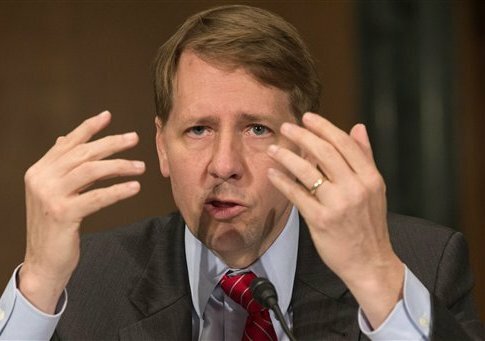 Consumer Financial Protection Bureau (CFPB) Director Richard Cordray received tough questions on Capitol Hill on Wednesday, when he was forced to defend plans for massive data collection by his agency and spending $184 million to renovate the CFPB’s headquarters that he described as a "dump." Chairman of the House Financial Services Committee Jeb Hensarling (R., Texas) held the hearing to examine numerous complaints about how the CFPB is managed, including allegations of widespread discrimination and retaliation. "Properly designed, the CFPB is capable of great good on behalf of consumers," Hensarling said in his opening statement. "It is also capable of great harm." The agency has grown into a "federal leviathan," Hensarling said, to employing 1,400 people and $500 million budget in just three years. Part of that budget is going toward the renovation of the CFPB headquarters, which the committee estimates at $184 million. The building, which was built in the 1970s during the Brutalist architecture movement, is only estimated to be worth $154 million. "Let me just ask you about specific costs, they come from public documents that have been filed, and with taxpayer money—you do agree it’s taxpayer money that you are spending?" Hensarling said. "I would say that I have children, too," Cordray said, responding to a remark Hensarling made about how he fears how the debt will impact his kids. "And I care about the debt as you do, for the same reasons." "I just asked, do you agree it’s taxpayer money?" Hensarling said. "It is federal government money that comes from the Federal Reserve," Cordray said. "Okay, so it’s difficult for you to say it’s taxpayer money." "I don’t know whether taxpayer is the right term or not," Cordray replied. "It’s the money of Americans." "I would say the taxpayers feel it’s the right term," Hensarling said. Hensarling then questioned the building’s upgrades, including, "shady tree bosque, an elevated timber paved porch, covered by dark bronze covered trellis, an illuminated limestone seat wall, a raised water table flowing over waterfall of naturally split granite in a four story interior glass staircase." "Clearly this is something within your power to say no to, to symbolically tell the American taxpayer you understand it’s their money," Hensarling said. Cordray defended the upgrades as something any "halfway functioning shopping mall" would have. "But it’s their money, it’s not the taxpayer’s money, Mr. Director, though," Hensarling said. "That’s my point. Do other federal buildings—I haven’t seen the waterfalls." "Come see the building," Cordray said. "It’s a dump." "Well apparently it’s not going to be a dump after you finish, with your granite waterfalls and your tree bosque," Hensarling said. Cordray was also questioned about "widespread discrimination and abuse of employees" at the CFPB. Whistleblowers came forward to testify in April alleging a "pervasive culture of retaliation and intimidation" at the Dodd-Frank office. Angela Martin, a senior enforcement attorney at the agency, testified that Cordray told her to "back down" after filing a complaint that senior managers within her office bullied and demoted her for speaking out against mismanagement. Cordray said on Wednesday that he had many conversations with Martin, but that he did "not recall" telling her to back down. "I don’t dispute any conversations, my goal was to productively resolve her matter," he said. "I don’t know if I did or not, but I certainly believe I did if she says so." "I simply wanted to have Ms. Martin reach a productive resolution of her complaint, which we did do so within a matter of a couple of weeks," Cordray added. "That later was reopened, and now we’ve resolved it again. I want her to have a good position at the bureau where she can do good work for consumers." The committee also questioned the CFPB’s plans to collect Personally Identifiable Information on millions of Americans in a National Mortgage Database. "I’m not speaking merely of names, addresses and phone numbers—though the database will certainly include those—but shockingly also people’s Social Security numbers, their race, religion, personal financial information, and even the GPS coordinates of their homes," Hensarling said. Hensarling added he would "fully expect to see in either Russia or China, but I’m appalled to see it in the United States of America." Cordray defended the mortgage database as necessary to conduct research, and said that reports have overstated what information the database will collect. However, Cordray did admit that information on mortgage owners would be kept "for long periods of time," but "de-identified" to not show the individual’s name or Social Security numbers. He also said religious affiliation would not be collected, and the information would not be shared with the IRS or NSA. The director’s remarks did not assure Rep. Michael Capuano (D., Mass.). "I would object incredibly strongly to having that information shared beyond those parameters," he said. "Honestly, why are you keeping any of the data? Once you do your research, why keep it?" "Because it’s ongoing work that we’re having to do," Cordray said. "We need to see what’s happening in the mortgage market over time." "Are you keeping my individual mortgage data for 20 years?" Capuano said. "De-identified, so nobody would have any idea that it’s you or me, or anyone," Cordray said. "Yeah, I’ve heard that before," Capuano replied. "And I love ya, you know I support the agency, I don’t trust that answer from a governmental agency." This entry was posted in Issues and tagged Consumer Financial Protection Bureau. Bookmark the permalink.